“Construction labor in Orlando has become more sophisticated than other markets as a result of working on some of the most complex and unique structures and finishes in the world – notably, the attractions have raised the game; as a result, Orlando is a mecca for unique construction work and enables us to attract and retain top talent,” said Sean DeMartino, President, Coastal Construction of Central Florida. Consider global companies like KPMG, the United States Tennis Association (USTA) and Johnson & Johnson who have all chosen to build brand new state-of-the-art facilities, and in record time, in Orlando. Bigger than most professional sports arenas, KPMG’s $430 million global learning, development, and innovation facility is under construction in Orlando’s Lake Nona community. Construction began in the spring of 2017 and a little more than a year later, is already over half way completed. KPMG’s new facility will use the latest technologies to train its global team of accountants, consultants and auditors. The immersive layout and design of the building is planned to give employees a strong sense of community, as well as an understanding of the company’s history and culture. The space will include an Innovation Center, a museum, as well as 800 guest rooms, fitness and outdoor recreational facilities, and multiple food and beverage venues. Aerial photo of Orlando's Lake Nona community. Construction dollars go further in Orlando. According to the R.S. Means 2018 Construction Index, Orlando’s cost of construction and labor is significantly cheaper than the national average, scoring 85.4. Combined with Florida’s lack of a state property tax as well as a low corporate tax rate of 5.5% (16th lowest in the U.S.), Orlando serves up savings almost as much as sunshine. Plus, with an average of 233 sunny days per year, construction projects move forward quickly all year round. It's 21 percent less expensive to hire construction workers in Orlando compared to the U.S. average, according to wage data from JobsEQ. And when compared to other low-cost, fast-growth cities, construction wages are approximately six percent lower than Austin and Miami and 11 percent lower than Atlanta and Phoenix. Labor was just one of the many factors that allowed the brand-new manufacturing labs in NeoCity, Fla. to be constructed in just 16 months. The microelectronics fabrication facility provides 109,000 square feet of laboratory and manufacturing space with two cleanrooms, one operating at Class 100 and one at Class 10,000. The lab serves as a research foundation to spark innovation in the master-planned NeoCity district, 500 acres of available sites – plenty of space for high-tech companies to set down roots. Not just land, Osceola County is also building a pipeline of STEM talent; every school district in Osceola County is required to provide STEM education. In fact, the county is building a new $15 million high school entirely focused on STEM education in NeoCity. Rendering of NeoCity, Fla., master-planned business technology district in Osceola County. When Verizon choose to build its Center of Excellence in Orlando, it needed a central location to consolidate its accounting, finance and back office operations. Verizon was able to find a centralized hub in Orlando’s Lake Mary, with easy access to its clients from Orlando’s two international airports and a short distance to Orlando’s commuter rail, SunRail. SunRail will also connect to UCF Downtown, in partnership with Valencia College, a downtown campus that will serve 7,700 students and open in August 2019 in the city’s core. 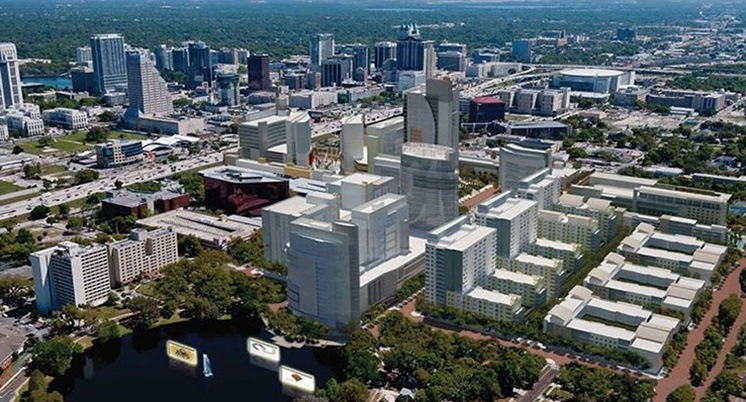 The downtown campus will activate Orlando’s Creative Village – 68 acres of mixed-use development sites. Conceptual rendering of vertical development in Creative Village. In Q2 2018, Orlando boasted over 34 million square feet of available office space and 6.5 million square feet of available industrial building space, according to CBRE. Local Orlando governments have fast tracked permitting and processes to speed up the construction process. For example, the Orange County administration has fast track permitting for subcontractors and building contractors that includes an online portal for plan submittal and easy, transparent tracking of records and submissions. Osceola County features a 5-day Fast Track Permitting process and an electronic process called ePermits. In Seminole County, the county government hosts an online system – Building Permits (BP) Online – that offers building permit information 24 hours a day, seven days a week. Johnson & Johnson announced the building of its Human Performance Institute’s headquarters in March 2018, and the facility’s construction is due to be completed at the end of the year – an extremely fast turnaround in part because of its permitting approval by the City of Orlando in just 17 days. The $18 million in a state-of-the-art campus will house the Institute's multidisciplinary training center and serve as the global hub for continuing research and development. Rendering of Johnson & Johnson Human Performance Institute in Orlando. Orlando offers the opportunity to build from the ground up in a region that adds over 1,000 jobs and 1,000 new residents each week. Orlando is growing faster than any other metro in the country – and companies are quickly taking advantage of that growth. The availability of land, business-friendly tax environment, and willingness of communities and governments to partner with businesses all create a welcoming environment for companies to make dream homes come true.